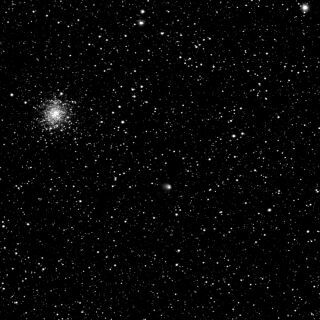 Comet 67P/Churyumov–Gerasimenko seen towards the constellation of Ophiuchus (note that from the vantage point of Earth, both the comet and Rosetta are presently in Sagittarius), with the globular cluster M107 also clearly visible in the field of view. The image was taken on 30 April 2014 by the OSIRIS Narrow Angle Camera. Far out in space, near the orbit of Jupiter, a European spacecraft named Rosetta is chasing a comet that has recently developed an ethereal veil. New images from Rosetta show that an 800-mile-long (1,300 kilometers) cloud of dust, known as a coma, has sprouted from the core of the comet 67P/Churyumov-Gerasimenko. Rosetta's scientific imaging system, OSIRIS, captured this coma in a series of photos that were taken between March 27 and May 4 and released by the European Space Agency today (May 15). Rosetta is still 1.2 million miles (2 million km) away from the comet. But in just a few months, the spacecraft will be inside 67P's dusty cloud, accompanying the icy wanderer on an unprecedented journey to the inner reaches of the solar system. The new photos from Rosetta also allowed scientists to refine their estimates of the comet's rotational period: 67P spins around once every 12.4 hours, approximately 20 minutes less than previously thought, the team discovered by tracking changes in the comet's brightness. The 6,600-lb. (3,000 kilograms) Rosetta spacecraft is set to arrive at the comet in August. The probe looks like an aluminum box, measuring about 9 by 6.8 by 6.5 feet (2.8 by 2.1 by 2 m) with long solar panels that span 105 feet (32 m). The spacecraft is also carrying a robotic lander named Philae, which will be the first spacecraft to touch down on a comet if its November deployment goes as planned. Rosetta's upcoming rendezvous with the comet is more than a decade in the making. The $1.4 billion spacecraft launched in March 2004, but it couldn't take a direct flight to 67P. Instead, the probe was steered through a complex series of gravitational slingshots around Earth and Mars to catch up to the 2.5-mile-wide (4 km) comet. Rosetta was put into a deep sleep in July 2011 for the final and longest leg of its journey and was finally jolted awake in January 2014.